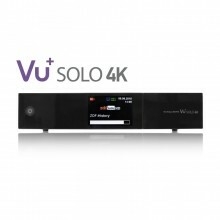 Vu Plus Solo 4K UHD - The next generation Ultimate UHD 4K PVR. VU+ Solo 4K Twin DVB-S2 Linux UHD set-top box Digital satellite receiver for UHD and HD TV and radio programs. The heart of the VU + Solo 4K is the 10,000 DMIPS (2x 1500 MHz) strong ARM processor and twin FBC tuners DVB-S2 tuner. Experience Ultra High Definition (UHD) TV with your VU + Solo 4K set-top box. What are FBC tuners? Full-Band Capture Satellite Set-Top Box: Broadcom's FBC technology digitizes the entire 950-2150 MHz satellite spectrum, replacing multiple discrete tuners with only one FBC chipset. This enables bandwidth deployment flexibility, reduced power consumption and faster channel change with Broadcom's FastRTV. Broadcom's FBC satellite technology enables lower overall complexity and system costs by replacing up to eight satellite chips and achieving more than 65 percent reduction in the number of connections between front-end and back-end devices. Click the button below to add the Vu+ Solo 4K Ultra High Definition Twin Tuner PVR Linux to your wish list.